Inverti 15 oz. 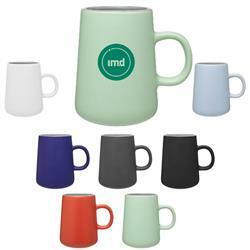 Stoneware mug is sleek and stylish with its matte finish and unique shape. Inverti comes in a variety of eye catching colors with a glossy gray inside finish. 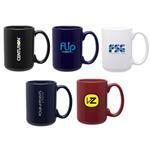 This mug is microwave safe so you can easily heat up your drink. Production Times Available: 5-7 business days. Rush Avaliable! Dimensions: 4-3/4" H x 4-3/4 (w/handle)"